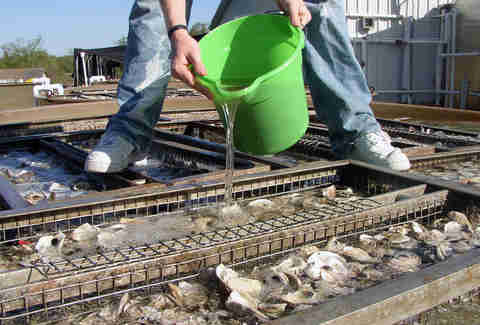 All oysters need is clean water. These guys are at the bottom of the food chain, filter-feeding on algae. It’s literally just the water that's shaping these guys. 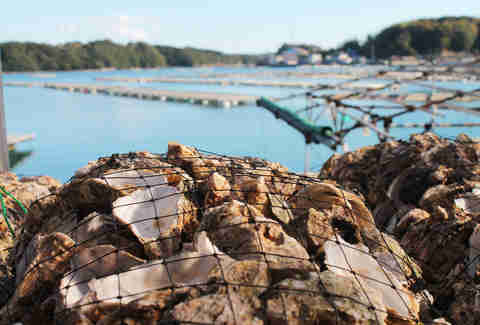 Like French terroir, oyster farmers get merroir. 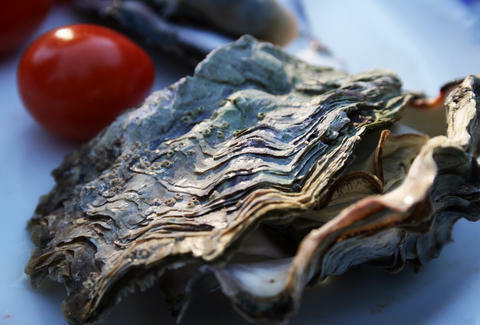 The characteristics of the water imprint on the flavor of the oyster. Mer means "sea" in French, and "terre" means earth or soil. So, yeah, they didn't really think that through. There's no equivalent of oyster lamb. To get to the 4in market size, it takes 24 months. Factor in that you'll lose about half of every crop you cultivate and it's a serious labor of love. Sure, that's about 250 thousand oysters, but that small footprint can be worth an impressive $200,000. It takes five pounds of wild fish to produce one pound of edible salmon. Like we said, it takes zero pounds of anything to make oysters. 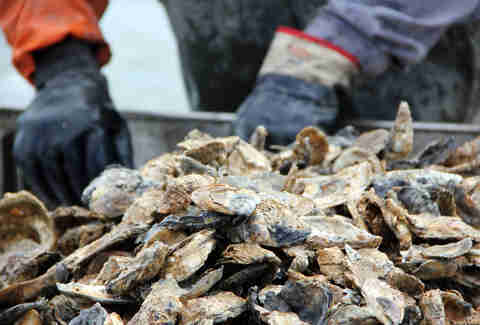 And one oyster can filter about 50 gallons of water a day, which helps keep the whole region healthy. No machinery or fancy equipment can currently reap an oyster bed -- it's all done the old fashioned way: hiring orphans with quick hands (kidding, OSHA). It's not enough that they barely need anything to grow; oysters live in cages or racks, providing shelter for other underwater friends like crab and fish. Not only do they absorb carbon and turn it into calcium carbonate to strengthen and grow their shells, the oyster's most impressive feat against climate change is their absorption of nitrogen -- the sleeper greenhouse gas and the third most serious in the lineup of gases that affect our environment. A three-acre oyster farm can account for the nitrogen waste of up to 35 people or one Prince Fielder. "So, who else'd you talk to for this thing?" The Billion Oyster Project is an ecosystem restoration project that engages public school kids by teaching them about aquaculture. Needless to say, these oysters are NOT fit for consumption and won't be for like, an entire century, but is anyone trying to put a billion extra cows anywhere 20 years from now? Nah. 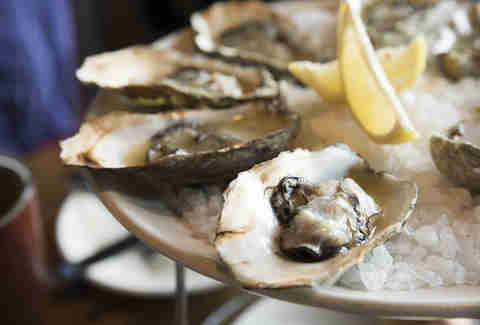 In the US, peak oyster consumption occurred during the early 1900s. 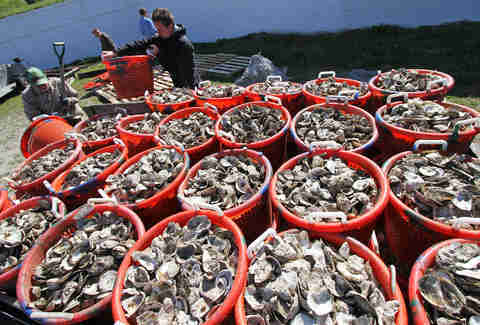 And some biologists estimated that New York Harbor contained half the world's oysters. A parasite came along in the late '50s and hit New York and wiped out 95% of the country's wild oyster reefs, and no, it wasn't the Commies. 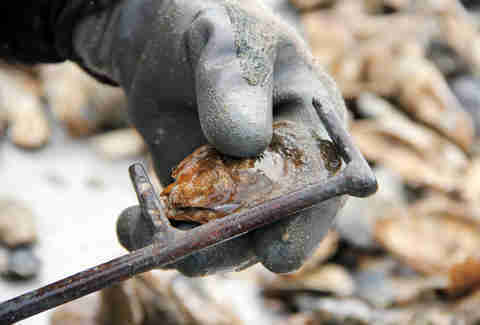 Farmed oysters (as opposed to wild) have been selectively bred to be impervious to this and other diseases. Imagine if corn farmers had to deal with 6ft to 8ft changes in dirt elevation every day. Normally, farmers like to work on their farms during low tide when the water is about 2ft deep -- which happens early in the morning and late at night. Remember that supermoon we had recently? Yeah, the oyster farmers had a blast with that one. Sometimes your farm might freeze over completely -- something that’s been happening a lot for the past two years thanks to those pesky polar vortexes. When it's really bad, it could mean staying home and farming another day -- but sometimes it just means that you wake up extra early for a couple of hours of breaking ice any way you can.